Marion Kelly (right), Executive Director of the West Roxbury Y, thanks Senator Mike Rush and Representative Ed Coppinger for their support of the plans to improve that facility. On July 29, state Senator Mike Rush and state Representative Ed Coppinger visited the West Roxbury YMCA to announce that the state has appropriated $500,000 for the planned renovations at that Y. Rush and Coppinger, both former Y members, discussed plans with the Y members, board members and staff who were in attendance at the event. The state funding will go toward renovations which will increase and improve accessibility for people with disabilities and create space for new programs, including fitness for seniors and stationary bike use for people with Parkinson's. Groundbreaking for the project is expected to take place at the end of 2013. Alice Erickson, second from right, celebrated her 75th summer at Sandy Island, along with some of her children, grandchildren, and her first great-grandchild. Last month, staff and campers at the Y's Sandy Island Family Camp celebrated camper Alice Erickson's 75th summer at the camp. Currently residing in Needham, MA, Alice first visited Sandy Island as a 9-year-old in 1934 and has been back with her family every summer since, with the exception of four years during World War II. Alice's first impression of Sandy Island in 1934 was that "it was relaxed and comfortable and we children could run around the island all day and play in the water. We loved it!" During her first summers at camp, there was no electricity or running water, the island was home to more trees and fewer buildings, and children's activities were less supervised than they are today. Alice continued coming to Sandy Island every summer as she grew up, and she even met her husband Harold at a camp dance. Naturally, Alice and Harold introduced their four children to Sandy Island, and they have all continued to come to camp as adults, along with their children. This summer, four generations of the Erickson family gathered at camp together - currently the only four-generation Sandy Island family. At age 88, Alice continues to enjoy her daily swim and the camp dances at Sandy Island, in addition to admiring the scenery. "What I've always liked about Sandy Island," said Alice, "is that it is family-oriented. Families can spend time together and there are a lot of healthy wholesome activities to choose from." Earlier this month, the National Summer Learning Association announced that the Boston Summer Learning Project has won its New York Life Excellence in Summer Learning Award. Boston was selected through a rigorous and competitive process from among 90 national applicants. The YMCA of Greater Boston is one of 18 community organizations partnering with Boston Public Schools, the Boston Opportunity Agenda and Boston After School & Beyond, all working together to reduce summer learning loss through innovative summer programs. This summer, the Y has welcomed 60 youth each week to the Summer Learning Program at our Ponkapoag camp location. When Kevin visited the camp last month, the students greeted him with handmade thank you cards. One of the most challenging issues facing youth and teens today is bullying by their peers. This summer, 320 teens in 12 of our branches have taken part in the Y's Cyber Bullying program, learning how to recognize and intervene when they witness inappropriate behavior on social media sites. S - Say what you feel. Let the bully know it's not okay. A - Ask for help from teachers or adults. individuals if they are with a group of people. As September nears, the YMCA of Greater Boston is gearing up to welcome more than 2,500 Greater Boston kids back to our after school programs. With over 50 locations throughout Greater Boston including in over 30 public schools - 21 in Boston - the YMCA is playing a critical role in helping children suceed in school and beyond. At the Y, our summer has been spent on refining the details of our major child care quality initiative: The Blueprint for Child Achievement. This initiative will result in further strengthening the support that children and families receive in our after school programs. One after school program mom, Lynne, says, "My children love coming to afterschool. The structure, support and caring is the stuff that made a positive impact in both of my children by helping them with coping skills, homework and having fun in a safe environment." More information about our Y's after school programs is available on our website. 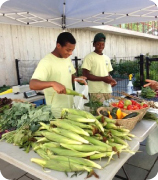 Thanks to a grant from the Henry P. Kendall Foundation, five YMCA of Greater Boston inner city youths have been spending their summer working on the farm at the Bradley Estate in Canton, MA as part of the City Harvest Youth Conservation Corps program through the Trustees of Reservations. The teens work in the greenhouse and garden beds and participate in enrichment blocks covering such topics as diversity, public speaking, and presentation skills. Farming experts and others also come in each week to teach the youth about different topics ranging from types of produce, pollination, nutrition, cooking, and others. The youth put their new skills to use, leading field trips and giving tours of the farm to younger students. They are also responsible for setting up farmers' markets in Mattapan, Dorchester, and at the Roxbury YMCA. Many use their native language of Spanish or Creole to help educate the public about fresh local produce. This eye opening experience is not only a paycheck, but also an opportunity for personal and professional growth outside the city streets and an opportunity to be more involved in their communities. Evelyn Kaupp, Tax Partner at Deloitte, first became a member of the Allston/Brighton Y (now the Oak Square Y) in the late 1980s when she first moved to Boston. A few years later she joined that branch's board as Treasurer. Evelyn was elected to the General Board in 2013 and is currently the Chair of the Audit Committee. What role has the Y played in your life? Rather unusually, I did not grow up with the Y, but as a newcomer to Boston over 20 years ago, it was a great way to get involved in my neighborhood and do something that would improve the neighborhood for its residents. I was on the Allston/Brighton Y board when we undertook building the Oak Square Y, which was a tremendous example of the Y partnering with all facets of a neighborhood - residents, businesses, politicians, etc. - and I was proud to be associated with it. I made many friends through the process and really felt like I had settled into Boston. Why do you volunteer with the Y? 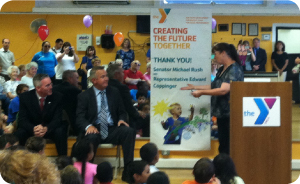 I have stayed involved with the Y for over 20 years because of the great work I see the Y doing. We all have busy lives, but we make it a priority to spend time on things we believe in and where we can see a difference being made in people's lives. I think the Y really embodies that - from Kevin Washington and his executive staff leading by example, right down to the summer camp counselor at any branch. How is the Y making a long-term impact on the Greater Boston community? I think the Y is the standard for showing how to partner with a varied number of parties with diverse interests within the city very successfully, whether it be community groups, schools, businesses, etc. Being the largest youth program provider within the city I think has long-term lasting effects for us all, especially those kids and their families.